A huge crowd of buyers were on had again for the Annual Cross Diamond Cattle Co. production sale. The Bred Heifers were sorted into calving groups and sold in volume to buyers across the Midwest. 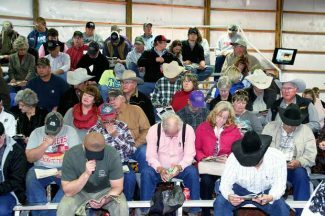 Bright sunshine and temperatures in the 50s set the tone for a hot sale at Cross Diamond Cattle Company on Dec. 8. Scott and Kim Ford, along with their consignors, showed a buying crowd great hospitality and volume selections of outstanding Red Angus genetics. The high selling bull, Lot 35, Crs Diamnd Synergy 3021, sired by Brown Synergy X7838 from a Hustler R588 X Rambo female sold to Gilroy Land and Cattle, Dalton, Nebraska for $26,000. Lot 1, Crs Diamnd Synergy 394, another Synergy son, from a Panhandle Sandman 4255 dam sold to Right On Cattle Company, Bertrand, Nebraska for $25,000. Lot 90, Crs Diamnd Granite 3269, a son of 5L Hard Rock 2188-09X and a BHR Copper D 773 daughter, sold to Gilroy Land and Cattle, Dalton, Nebraska for $22,000. Lot 19, Crs Diamnd Granite 3273, a son of 5L Hard Rock 2188-09X and a Beckton Epic R522K daughter sold to Right On Cattle, Bertrand, Nebraska for $20,000. Lot 3, Crs Diamnd Tradition 3272, a 5L Tradition 795-6707 son from a Beckton Epic R522 K daughter sold to Arrowsmith Red Angus, Bassett, Nebraska for $20,000. Lots 91 and 92, Crs Diamnd Landslide 356 and Crs Diamnd Landslide 307, both Poke Nebr707 9116 1064 sons, by Medallion N328 and Tradition 795-6707 daughters, respectively, were purchased by Tyler Dahlgren, Bertrand, Nebraska for $20,000 each. The high selling group of commercial bred heifers sold to Mark Bachman, Albia, Iowa. They were a group of 32 head of baldy and brockle heifers, selling for $3,650. The 50 head of three-year-olds, coming with their second calf, consigned by Paxton Ranch, Stapleton, Nebraska, sold to the Cherokee Ranch and Castle Foundation, Sedalia, Colo. for $3,610. Volume buyers were Flying U Cattle, Ogallala, Nebraska with 120 head of commercial heifers and Mark Bachman, Albia , Iowa with 52 head of commercial heifers. Volume bull buyers were LeBlanc Cattle Company, East Bernard, Texas, with 11 bulls; Glenn Cattle Company, Fort Morgan, Colo. with 10 head of bulls; Rapid Creek Ranch, Belvidere, South Dakota, with nine head of bulls; and Paxton Ranch, Stapleton, Nebraska with six head of bulls.